Imagery intelligence (IMINT) is an intelligence gathering discipline which collects information via satellite and aerial photography. IMINT is a subset of intelligence collection management which is a subset of intelligence cycle management. IMINT is complemented by non-imaging MASINT electro-optical and radar sensors. Although aerial photography was first used extensively in the First World War, it was only in the Second World War that specialized imagery intelligence operations were initiated. High quality images were made possible with a series of innovations in the decade leading up to the war. In 1928, the RAF developed an electric heating system for the aerial camera. This allowed reconnaissance aircraft to take pictures from very high altitudes without the camera parts freezing. In 1939, Sidney Cotton and Flying Officer Maurice Longbottom of the RAF suggested that airborne reconnaissance may be a task better suited to fast, small aircraft which would use their speed and high service ceiling to avoid detection and interception. They proposed the use of Spitfires with their armament and radios removed and replaced with extra fuel and cameras. This led to the development of the Spitfire PR variants. These planes had a maximum speed of 396 mph at 30,000 feet with their armaments removed, and were used for photo-reconnaissance missions. The aircraft were fitted with five cameras which were heated to ensure good results. The systematic collection and interpretation of the huge amounts of aerial reconnaissance intelligence data soon became imperative. Beginning in 1941, RAF Medmenham was the main interpretation centre for photographic reconnaissance operations in the European and Mediterranean theatres. The Central Interpretation Unit (CIU) was later amalgamated with the Bomber Command Damage Assessment Section and the Night Photographic Interpretation Section of No 3 Photographic Reconnaissance Unit, RAF Oakington, in 1942. During 1942 and 1943, the CIU gradually expanded and was involved in the planning stages of practically every operation of the war, and in every aspect of intelligence. In 1945, daily intake of material averaged 25,000 negatives and 60,000 prints. Thirty-six million prints were made during the war. By VE-day, the print library, which documented and stored worldwide cover, held 5,000,000 prints from which 40,000 reports had been produced. American personnel had for some time formed an increasing part of the CIU and on 1 May 1944 this was finally recognised by changing the title of the unit to the Allied Central Interpretation Unit (ACIU). There were then over 1,700 personnel on the unit's strength. A large number of photographic interpreters were recruited from the Hollywood Film Studios including Xavier Atencio. Two renowned archaeologists also worked there as interpreters: Dorothy Garrod, the first woman to hold an Oxbridge Chair, and Glyn Daniel, who went on to gain popular acclaim as the host of the television game show Animal, Vegetable or Mineral?. 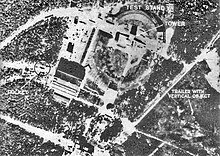 Aerial photograph of the missile Test Stand VII at Peenemünde. Sidney Cotton's aerial photographs were far ahead of their time. Together with other members of his reconnaissance squadron, he pioneered the technique of high-altitude, high-speed photography that was instrumental in revealing the locations of many crucial military and intelligence targets. Cotton also worked on ideas such as a prototype specialist reconnaissance aircraft and further refinements of photographic equipment. At its peak, British reconnaissance flights yielded 50,000 images per day to interpret. Of particular significance in the success of the work of Medmenham was the use of stereoscopic images, using a between plate overlap of exactly 60%. Despite initial scepticism about the possibility of the German rocket technology, major operations, including the 1943 offensives against the V-2 rocket development plant at Peenemünde, were made possible by painstaking work carried out at Medmenham. Later offensives were also made against potential launch sites at Wizernes and 96 other launch sites in northern France. It is claimed that Medmanham's greatest operational success was "Operation Crossbow" which, from 23 December 1943, destroyed the V-1 infrastructure in northern France. According to R.V. Jones, photographs were used to establish the size and the characteristic launching mechanisms for both the V-1 flying bomb and the V-2 rocket. Immediately after World War II, long range aerial reconnaissance was taken up by adapted jet bombers – such as the English Electric Canberra, and its American development, the Martin B-57 – capable of flying higher or faster than the enemy. Highly specialized and secretive strategic reconnaissance aircraft, or spy planes, such as the Lockheed U-2 and its successor, the SR-71 Blackbird were developed by the United States. Flying these aircraft became an exceptionally demanding task, as much because of the aircraft's extreme speed and altitude as it was because of the risk of being captured as spies. As a result, the crews of these aircraft were invariably specially selected and trained. There are claims that the US constructed a hypersonic reconnaissance aircraft, dubbed the Aurora, in the late 1980s to replace the Blackbird. Since the early 1960s, in the United States aerial and satellite reconnaissance has been coordinated by the National Reconnaissance Office. Early photographic reconnaissance satellites used photographic film, which was exposed on-orbit and returned to earth for developing. These satellites remained in orbit for days, weeks, or months before ejecting their film-return vehicles, called "buckets." Between 1959 and 1984 the U.S. launched around 200 such satellites under the codenames CORONA and GAMBIT, with ultimate photographic resolution (ground-resolution distance) better than 4 inches (0.10 m). The first successful mission concluded on 1960-08-19 with the mid-air recovery by a C-119 of film from the Corona mission code-named Discoverer 14. This was the first successful recovery of film from an orbiting satellite and the first aerial recovery of an object returning from Earth orbit. Because of a tradeoff between area covered and ground resolution, not all reconnaissance satellites have been designed for high resolution; the KH-5-ARGON program had a ground resolution of 140 meters and was intended for mapmaking. Between 1961 and 1994 the USSR launched perhaps 500 Zenit film-return satellites, which returned both the film and the camera to earth in a pressurized capsule. The U.S. KH-11 series of satellites, first launched in 1976, was made by Lockheed, the same contractor who built the Hubble Space Telescope. HST has a 2.4 metre telescope mirror and is believed to have had a similar appearance to the KH-11 satellites. These satellites used charge-coupled devices, predecessors to modern digital cameras, rather than film. Russian reconnaissance satellites with comparable capabilities are named Resurs DK and Persona. Low- and high-flying planes have been used all through the last century to gather intelligence about the enemy. U.S. high-flying reconnaissance planes include the Lockheed U-2, and the much faster SR-71 Blackbird, (retired in 1998). Planes have the advantage over satellites that they can usually produce more detailed photographs and can be placed over the target more quickly, more often, and more cheaply, but have the disadvantage of possibly being intercepted by aircraft or missiles such as in the 1960 U-2 incident. Unmanned aerial vehicles have been developed for imagery and signals intelligence. These drones are a force multiplier by giving the battlefield commander an "eye in the sky" without risking a pilot. Though the resolution of satellite photographs, which must be taken from distances of hundreds of kilometers, is usually poorer than photographs taken by air, satellites offer the possibility of coverage for much of the earth, including hostile territory, without exposing human pilots to the risk of being shot down. nm) at its orbital altitude of 590 km. This means that it would be impossible to take photographs showing objects smaller than 16 cm with such a telescope at such an altitude. Modern U.S. IMINT satellites are believed to have around 10 cm resolution; contrary to references in popular culture, this is sufficient to detect any type of vehicle, but not to read the headlines of a newspaper. The primary purpose of most spy satellites is to monitor visible ground activity. While resolution and clarity of images has improved greatly over the years, this role has remained essentially the same. Some other uses of satellite imaging have been to produce detailed 3D maps for use in operations and missile guidance systems, and to monitor normally invisible information such as the growth levels of a country's crops or the heat given off by certain facilities. Some of the multi-spectral sensors, such as thermal measurement, are more electro-optical MASINT than true IMINT platforms. To counter the threat posed by these "eyes in the sky", the United States, USSR/Russia, China and India have developed systems for destroying enemy spy satellites (either with the use of another 'killer satellite', or with some sort of Earth- or air-launched missile). Since 1985, commercial vendors of satellite imagery have entered the market, beginning with the French SPOT satellites, which had resolutions between 5 and 20 metres. Recent high-resolution (4–0.5 metre) private imaging satellites include TerraSAR-X, IKONOS, Orbview, QuickBird and Worldview-1, allowing any country (or any business for that matter) to buy access to satellite images. ^ Downing, Taylor (2011). Spies in the Sky. Little Brown Hardbacks (A & C). p. 42. ISBN 9781408702802. 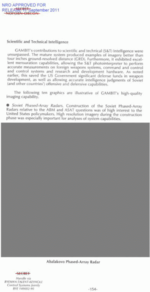 ^ "The GAMBIT Story, Appendix A, page 154, initial Sept. 2011 release". National Reconnaissance Office. June 1991. ^ "Discoverer 14 - NSSDC ID: 1960-010A". NASA. ^ "Imint resolution comparison". Federation of American Scientists. Covert Imagery, Peter Jenkins, ISBN 978 09535378 53, Intel Publishing UK.